Discussion in 'General Gaming' started by lightsout, Sep 22, 2018. Testing things out with a 4570s (low power I know but still) and a gtx 1070. Struggling with frames in the 30-40s. @ 1440p. Even set it to low doesn't seem to help much. I was curious if anyone is using an i5-K chip with a decent OC on this game? I know BF has liked more cores for a while, but I was hoping for better performance. What's your processor speed? How much of the Processor is being used while you game? Oh duh I wrote that in a rush. Turbo speed is 3.2 which I believe all cores are running at. It's pinned at 100% on all cores playing bf1. I fired up bf4 and the usage was high but performance was way better. I know it's an older game. I'm sure a clock boost would help but more threads is probably the only real answer. It will help a tad. I had a 3570k at 4.6Ghz.Cores pegged playing 1440p. Upgraded to a ryzen 1700, and had no issues after that. There's gotta be a setting that lowers CPU usage, either foliage density or shadow quality. It isn’t your CPU holding you back. Look at the Pentium G4560 (dual core) getting over 100FPS at 1440p with a Nvidia 1080 card. Something else is wrong with your setup. Yeah I know, I'll look into it. I mean its a clean install, new drivers, very light system right now not many apps running. Not sure what it could be. I can see the cpu in game, it never leaves 100%. That definitely will hinder performance wouldn't you think. 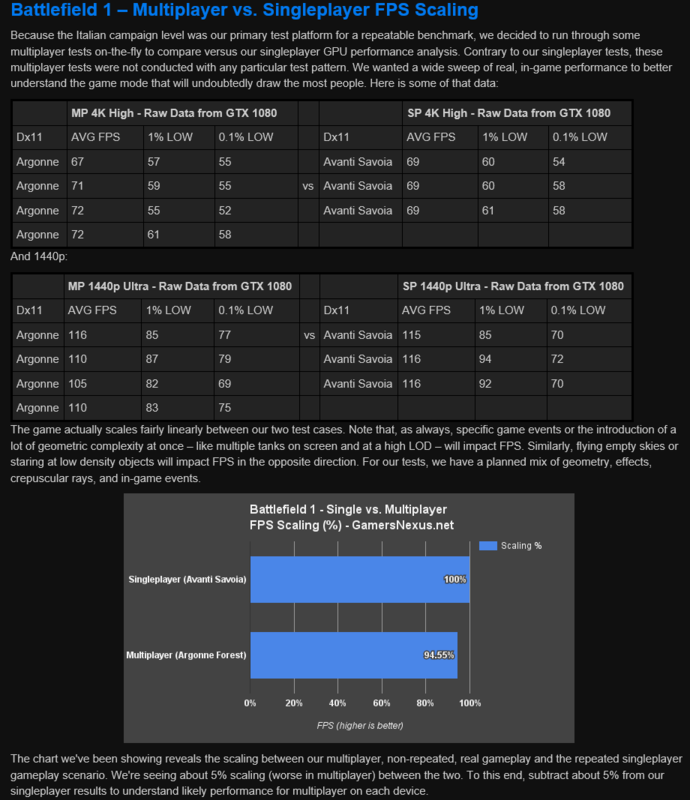 Plus theres a cpu review on Gamers Nexus and they seem to have quite different results. The TPU result there pretty much shows theres no difference. I'm not sure I agree. Threadpowerups results for Battlefield 1 show that game is NOT core dependant. In that same review I linked it clearly shows which games are. Civilization 6, Dishonored 2, and Hitmain for instance where the dual cores get only 60% performance of the quads or higher. Is TPU doing a canned benchmark or actual MP play through? I’m not sure, but it’s immaterial. The game wouldn’t drop from 100fps to 40fps because its single vs. multiplayer. I’ve never seen any game even come close to that. Not even if I’m running as the local host at offline LAN Party. He’s not running a dual core. He’s running a quad and with that particular game even low end pentium dual cores do just fine —as evidenced by a very compelling set of charts by TPU. I don’t know what the problem is, but it isn’t a quad core problem — which is the title and premise of this thread. Turn on Gams Mode if you have Windows 10 to help minimize background processes. How is heat on video card and CPU? Are either clock throttling. Download Intel Tuning utility and open it up while running the game to monitor heat and clock speed in a 10 minute window. Download MSI Afterburner for GPU monitoring to see if clock speed stays consistent. You’ll have to do a little troubleshooting. Lots of players running around on a server is greater cpu load. Would be great if there was a canned benchmark that could be used to test with for the op. As he said, other BF games play fine. I provided benchmark data backing my suggestion. Where is evidence a quad core isn't sufficient to run BF1 at greater than 30-40FPS (with a 1070 equivalent card) as the OP has? My suggestion is his low performance situation is atypical for the hardware he has - and the low performance numbers is not because he has a quad core. Having a lower clocked one certainly does not help his case. Ofc depending on how recent his windows install is there might be some processes running in the background that hamper performance that should go away once they finish, like windows update and that annoying indexing function (forgot it's name). Thanks man, seems I got a tiny bit of breathing room but didn't seem to help much. I am going to throw a 5820k at it, that better be enough. Did you try switching back to DX11 instead of DX12? I read that's a big fix for some people. Some of the topics I just read on it say people with ryzen 8 core or intel 6 core systems are having the same trouble you are - I don't think throwing more cores at it (throwing money at it) is a good solution until you diagnose the problem you currently have. here's a guide on the settings and their individual relevance to FPS hits. Steve lost about 5% FPS going from singleplayer to multiplayer. Jesus man, they tested on an I7 5930K. That is 6c 12t. Not 4c 4t. Come on now, you must have the deductive reasoning to see that is not exactly proof that a 4 thread i5 can handle BF1 multiplayer just fine. SvenBent and Araxie like this. My i5 4690k @ 4.2ghz with a 1070 played BF1 perfectly fine in Single/multi. Same generation just slightly higher clocked. Even at stock (3.9ghz boost) I wasn't getting mad stutters/fps drops. I was running on high or higher.. It's been a while since I played but I never had any issues with BF1 at 1440p60hz with my sig setup. Thanks I have tried DX11 and 12. I am not throwing money at, just have my rig temporarily with a 4570s. I already own the 5820k. Its definitely a cpu issue as the gpu will be at 40ish%, cpus will all be pinned and in a lot of battle (64 player conquest is all the games I can find) I'm in the 30's and 40's. Will see in a few days when I get my other rig setup. Try running borderless mode instead of fullscreen, try power setting to recommended instead of high performance. Also can you post the rest of the specs of your system? Is the memory running dual-channel mode and how much memory do you have? Also you could try a different version of Windows just to test it out on another hard drive or something. I could try borderless. The system has 8gb of 1600, running dual channel. A single SSD, Asrock Q87M Pro, not sure what else would matter. I can't try another windows but this is a clean install from a week ago. Intentionally meant to be a light system. I din't mess with services and all that but just not installing a ton of stuff. BF1 plays fine on my i7-4770 locked to 3.9 GHz. As far as I know the game doesn't even scale well past 6 cores, so throwing more cores at it isn't going to accomplish anything. Well hyper threading has helped since BF3 so I'm not sure thats true. i7's have done better than i5's, especially in 64 man conquest. For anyone that reads this, swapped out boards, took out the 4570s and installed other board with 5820k. I am now able to run on ultra and its chiilin in the 80-90 fps range. Sooo much better. I will say that this chip has a nice clock jump as well (4.3ghz) But still, moar cores!! I can attest to that. Really wish'd I'd picked up a 2600k instead of the 2500k I'd used for years, especially for Battlefield games. That seemed like the biggest jump, going from a 4.5GHz 2500k to a stock 6700k. Yup same, I grabbed a 2500k on launch day, and saw others with i7's getting better results. Ranulfo and IdiotInCharge like this. Well, it wasn't a mistake on release- what we didn't know then was how long the performance would last. I expected to upgrade a few generations later and instead waited four (or five?). Of course, not doing that one again . No. Techpowerup does all it's game tests from single player. it's not as demanding as multiplayer. Thus, it runs fine on a dual-core. Most other sites also use that sort of cheat for games that have single-player modes. The [H] does multiplayer tests if you want to dig for something relevant; I consider their benchmarks to be the standard for that purpose. And yeah, if we're talking single-player vs. multi-player BF games, the difference can be night and day, and certainly the difference between hyperthreading with and without. Oh man I always looked at TPU, good to know thanks. It is definitely CPU limited. Anybody who plays it regularly can tell you this. I have a GTX 1080 but some maps bring my i5 6600k @4.3ghz to 60fps. So I've actually just decided to run the game at a really high resolution so I can keep a locked 60fps. Troll around for a 6700k or 7700k, for the easy upgrade. if you CPU is peaked at 100% you have aa clear sign of CPU bottleneck. So now you need to figure out why. Is it only BF1 process that take resources from your CPU ? at gpu bottleneck 4k, the cpu becomes almost immeterial, and that is the op's question.